Location: Hono a Piʻilani Highway, Honokahua Bay. Description: Honokahua Beach, fronting Fleming Beach Park, is a straight 1,500-foot long and 150-foot wide white sand beach that lies between two lava points. Large ironwood trees dominate the low sand dunes in the backshore. The prevailing wind elevates the dunes near Makaluapuna Point, the south point of the bay. A shallow sandbar fronts most of the beach and extends offshore to the surf line, except at the east end, which is fronted by a shallow reef. The foreshore is steep, the result of the high winter surf sweeping across the beach. Facilities in Fleming Beach Park include restrooms, showers, and parking. Precautions: During periods of high surf, especially during the winter months, a powerful shorebreak forms on the Fleming Beach Park sandbar, generating dangerous rip currents along the entire length of the beach. High surf may also generate a strong backwash across the sandbar. Lifeguards are on duty daily. Check with them before going in the water. and converted the cattle ranch to a pineapple plantation. This was the beginning of Maui Land and Pineapple Company, an industry that continues today. Fleming's home, completed in 1915 and named Makaʻoiʻoi ("keen eyes"), is now the Pineapple Hill Restaurant. Fleming Beach Park is situated on Honokahua Bay, one of the six famous bays of West Maui, which are collectively known as Hono a Piʻilani or the "bays [acquired] by [Chief] Piʻilani." The name of each bay begins with "hono," or "bay," and in order from north to south they are Hononan ("animated bay"), Honokohau ("bay drawing dew"), Honolua ("two bays"), Honokahua ("sites bay"), Honokeana ("cave bay"), and Honokowai ("bay [for] drawing water"). 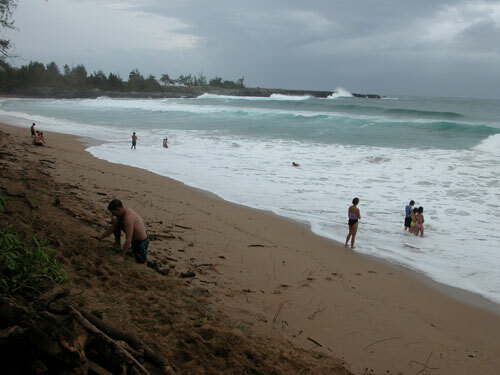 Fleming Beach Park is the most popular bodysurfing and bodyboarding site on West Maui. Surf breaks almost daily on the sandbar fronting the park, even during the summer months, as long as the trade winds are blowing. This break attracts many visitors and residents. Occasionally, surf on the small reef at the east end of the beach is good enough for surfing.